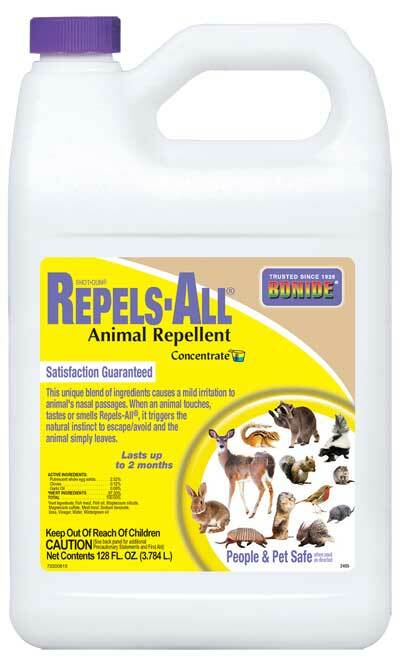 Prevent animals from nibbling on your favorite plants with this Bonide Repels-All Animal Repellent Concentrate. This environmentally safe, biodegradable liquid effectively deters deer, rabbits, squirrels, chipmunks, and a bevy of other animals from frequenting your garden. Mix this concentrate with water, and spray it around your shed, barn, trash can, woodpile, or any other area you have seen animal damage. The product causes a mild irritation to the animal's nasal passages which triggers a natural instinct to escape or avoid the unpleasant sensation. This ensures animals are not harmed, but does persuade them to reconsider their intentions. Treat bulbs and seeds with a bit of this product prior to planting or storing, to protect them from birds and mice, or spray the solution on the leaves of your ornamental plants as an added deterrent. Thwart animals from destroying your property or your favorite shrubs with this Repels-All Animal Repellent Concentrate. Made in the USA. Bottle Size: 128 fl. oz. Bonide Turbo Spreader Sticker Concentrate, 8 oz. Bonide MoleMax Mole & Vole Repellent, 10 lbs.